Due to high industrialization and urbanization rates, solid waste has increased by 40 per cent in Peru over the last decade, negatively impacting the environment and peoples health. National UN Volunteers have been reinforcing community level resilience and strengthening civil society by conducting activities aimed at changing attitudes about and practices related to waste reduction and management. Due to high industrialization and urbanization rates, solid waste has increased by 40 per cent in Peru over the last decade, negatively impacting the environment and peoples health. A group of people in Lima recover recyclable waste as a source of income for their families, but they do this in unsuitable conditions that endanger their health. This is why the Arequipa Provincial Municipality and the Ministry of Environment of Peru  through the technical assistance of the United Nations Development Programme (UNDP) and the United Nations Volunteers (UNV) programme  launched the Integrated Solid Waste Management for Inclusive and Sustainable Development project, implemented within the Poverty and Environment Initiative by the Ministry of Environment of Peru. Acknowledging that poverty is simultaneously a cause and a consequence of environmental problems, UNV has supported the Poverty Environment Initiative that takes a gender-sensitive approach to waste management and avails technical assistance to local governments and informal recyclers. National UN Volunteers on this project have been reinforcing community level resilience and strengthening civil society by conducting activities aimed at changing attitudes about and practices related to waste reduction and management. The project aims to improve the welfare of recyclers through appropriate solid waste management, with an emphasis on the empowerment of women recyclers. The objective is also to make the recycling trade more accessible to people living in poverty, and to create a culture of recycling for the protection of the environment in the city. 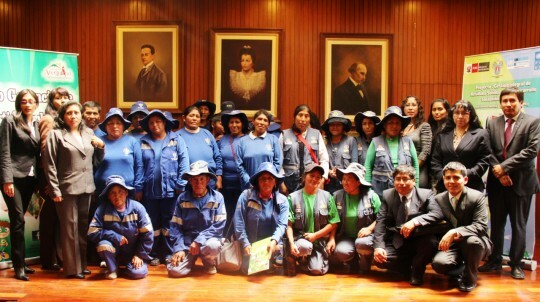 The initiative will contribute to improving the living conditions of 150 recyclers and will promote proper solid waste management in 30,000 Arequipa households and amongst 150 leaders and 350 volunteers. Article translated from Spanish by UN Online Volunteer Lucy Yearwood.